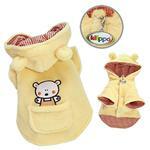 Soften up your little one with this fuzzy Plush Country Bear Hooded Dog Jacket by Klippo! Cold weather won't stand a chance with the adorable and soft Plush Country Bear Hooded Dog Jacket by Klippo. This fuzzy dog coat instantly transforms your pup into a fuzzy bear with plush fabric and a cute hood with teddy bear ears. This plush coat has an adorable bear applique on the back above a pocket that's perfect for holding waste bags. 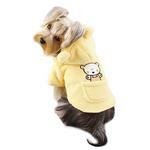 For extra flare and warmth, this dog coat features a gingham cotton lined interior (color may vary from picture). There is a leash access opening for walking ease. This dog jacket is easy to apply with a snap closure at the chest. A high-cut tummy keeps your pup clean and dry. You'll also receive the trademark Klippo charm with a tiny D-ring attachment. Plush Country Bear Hooded Dog Jacket by Klippo Customer Photos - Send us your photo! Zuzu looks just adorable in this teddy bear hoodie by Klippo. The small fits her perfectly for my 3 pound teacup poodle and she fell asleep in it because it was so cozy. Roxy is super adorable in her bear hoodie. Look how cute my dog is in her new bear hoodie. Posted On 12/05/17 by Deni S from New York, NY Yes, Deni S recommends this product! Posted On 11/07/17 by Deni S from New York, NY Yes, Deni S recommends this product! Posted On 10/10/17 by bobby junior from , Yes, bobby junior recommends this product! Posted On 05/02/17 by Amanda A from Australia , Yes, Amanda A recommends this product! My puppy looks like a cute little bear in her new country bear jacket. 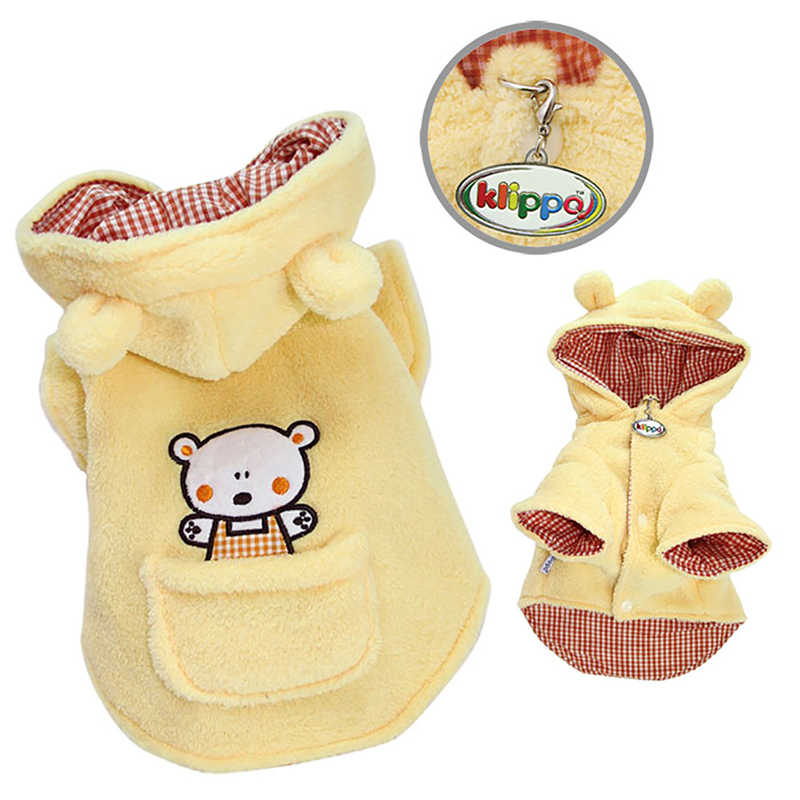 It is so soft & comfortable & the hood with little bear ears sits easily on my puppy's head. The only difference from the picture on ordering is that it is lined with yellow check instead of red check, but I don't mind that. I went with the small since it was closer to my dogs measurements. It was still too small, a medium would be big in other areas. It's so cute it was hard to return! Posted On 05/01/17 by lauren from allentown, PA Yes, lauren recommends this product! I have the large for my 10.5 lbs fits her a little big. A must have so so cute. Posted On 01/23/17 by Karen E from HV, TX Yes, Karen E recommends this product! This fits so well and our baby loves to cuddle up in it. How cute! Posted On 01/21/17 by Crystal G from Manchester , NH Yes, Crystal G recommends this product! Super cute but runs small so I would recommend ordering one to 2 sizes up. Posted On 01/08/17 by Hiromi C from Los Angeles, CA Yes, Hiromi C recommends this product! Well made, soft, and cute for my boy dog. Great price for what you get! My little Roxy is so super cute. I just love this hoodie on her. Posted On 12/26/16 by Debbie P from , MI Yes, Debbie P recommends this product! This jacket is so soft and warm! It's just what we need for a little pup who is cold all the time. It's so cute! LOVE this bear hoodie !!! It is sooo much cuter in person !! A must buy for your dog. Don't think about buying it just do it !!! Posted On 10/17/16 by Lauren H from allentown, PA Yes, Lauren H recommends this product! Posted On 10/15/16 by Regina from , CA Yes, Regina recommends this product! Cute jacket! Very soft material and seems comfy to wear. My dogs found their ONE little Christmas dog to be their favorite, so I ordered 2 more so their would be three times as much fun.